Get file servers under tight control. Keep track of file and folder deletions, file modifications and folder permission changes. No credit card information is required. Trial will be sent to the specified email. Right after install File System Auditor starts capturing events in real-time not requiring agents. File System Auditor saves file access events in the the centralized database for historical reporting and analysis. Company’s most important asset is data. It must be adequately audited for unauthorized or unplanned and potentially harmful changes. In modern Active Directory based networks data most often resides on Windows file servers. Unfortunately native tools do not provide sufficient degree of auditing and reporting of file system changes. Implement File Integrity Monitoring. Meet the most critical requirements of various compliance regulations including PCI-DSS, SOX, HIPAA and others. Raise privileged users accountability. Review how privileged accounts use provisioned access across the entire park of file servers. Verify access control policies. Track who gives access to what files or folders and to what individuals or groups. Prepare for security investigations. Get all the data and tools that will be later used for forensics analysis involving data loss and access abuse. Protect unstructured data. Know how sensitive documents and various file resources are accessed and by what users. Find out who deleted files and folders on a file server. Detect both local and remote changes to the file system. 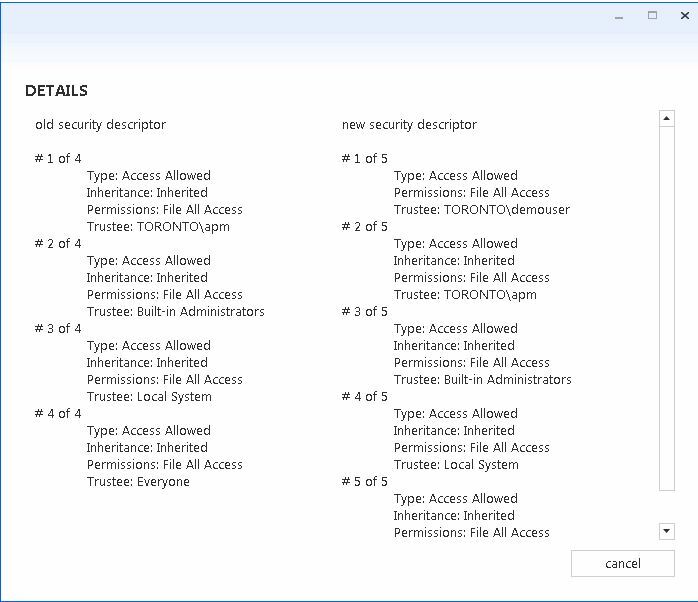 See what specific permissions were added or removed to the file ACL. Capture changes to file attributes and file contents. See what application was used to make a change. SecureHero File System Auditor is one of the most simple and easy to use Windows File Access Auditing software in the market that gets the job done. It has an attractive licensing model and most importantly reliable support. As an IT service provider, part of our value proposition is data security. We were looking for software that could monitor files access, folder access and user logons all-in-one. By putting every employee’s activity in file servers on the radar, SecureHero saved us days worth of manual work and indeed became our hero!